I'm still learning Accordance, so others may correct me or suggest a better way, but this is what I think you need to do. 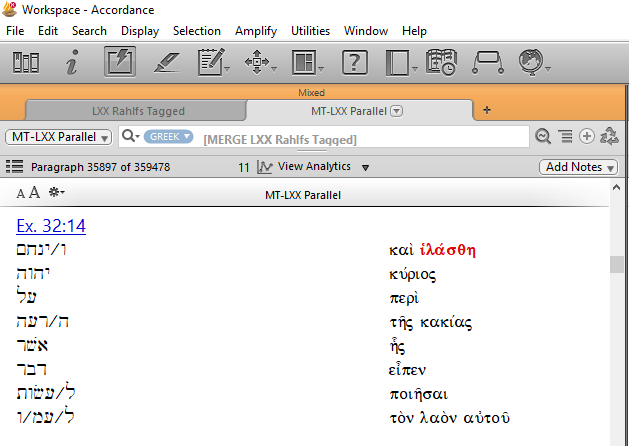 1) Open the LXX; 2) Search for ἱλάσκομαι; 3) Open a new tab with the MT-LXX Parallel; 4) Use the MERGE command to link this tab with the LXX tab. 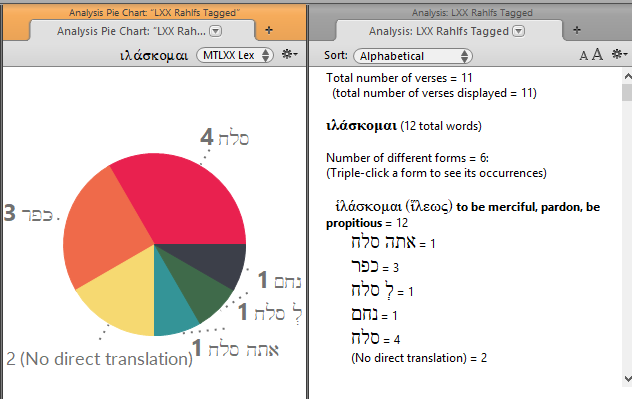 As the graphic above shows, the Greek word is highlighted, but a person would need to go through all the hits and pick out the Hebrew. UPDATE: I had initially lamented there was no way to see the Hebrew roots in Accordacnce. 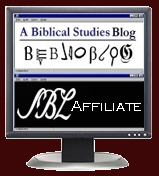 Thanks to Joel Brown from Accordance, I need to update this entry, because there is an easy way to see the Hebrew roots underlying the Greek. This is the ideal way for getting the results desired in the initiating question. 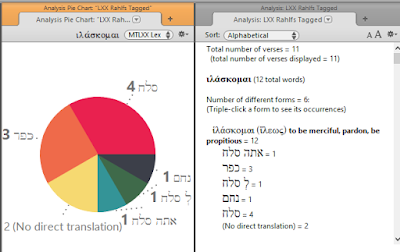 Accordance can perform some other nifty tricks by combining MERGEs in order to see where a specific Hebrew word is translated by a specific Greek word. Cf. David Lang's guide HERE. One drawback of BW is that it cannot do Greek root searches, so if I wanted to look at cognate forms of the Greek word, I would need to search each one separately. I have chosen to organize the analyis by the Hebrew lemma, and I'm provided with a clear view Greek and Hebrew lemmas and a full analysis of each. That is extremely helpful, but... I cannot find an easy way to copy/paste out the information. Logos does allow root searches, so I could also generate results like this for all cognates. Here is a clear illustration of the Hebrew words underlying the Greek, and clicking on any one of the segments will display all the places where it occurs. Again, extremely helpful, and I can right-click to copy the graphic, but I dont see any way to generate a simple listing. There you have it. A few things to note. The English Gloss is there because those are instances where the LXX differs from the MT, so there is no underlying Hebrew. Fine print! If you've been counting, the results displayed miss 2Chron 6.30 which showed up in my other searches. Why? It's a text critical issue. In that verse, Rahlf's edition of the LXX has the word ἱλάσῃ from ἱλάσκομαι. In Swete's edition of the LXX, however, the word is ἰάσῃ, apparently from ἰάομαι. I checked a print copy of Swete, and that's indeed what he has. Is it a typographical error in the print edition? I think the sense is: "You will hear from heaven... and you will heal (instead of expiate) and give to a man according to his ways." I.e, the Lexham Analytical Lexicon apparently is using Swete rather than Rahlf's. Oddly, the Lexham English Septuagint tries to render ἰάσῃ as a name, Jahaziel. 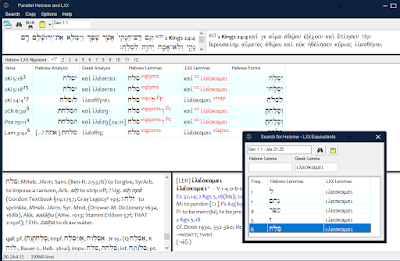 Accordance probably does the best job of addressing the task of finding all the underlying Hebrew words translated by a specific Greek word in the LXX. It also the advantage of being able to do a Greek root search for a broader scope. Logos is a very capable program, and using the Lexham Analytical Lexicon of the Septuagint is the easiest way of all. It also offers the most presentation and hyperlinked options. 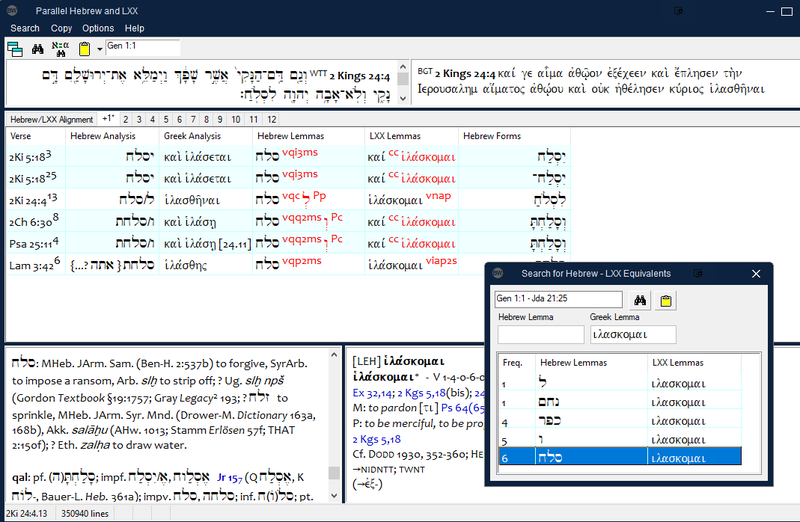 BibleWorks does accomplish the task in its own way and can generate the list of Hebrew words simply. I certainly don't think a person is going to buy one of these programs simply based on this exercise, but I hope it gives an idea of what each is capable. To see another example of how to use the MT-LXX parallel to conduct other tasks, you'll want to read this earlier post where I walk through some examples. If I've missed some better or easier way to address the originating question, please let me know in the comments.